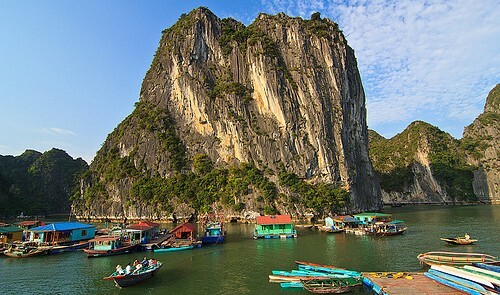 Though Quang Ninh Province in northern Vietnam has relocated a number of households, the provincial authorities still allow them to offer row boat trips in UNESCO-recognized Ha Long Bay to make a living and diversify tourism services, the Vietnam National Administration of Tourism said Wednesday on its website. The province recently finished relocating more than 300 households living in the core areas of Ha Long Bay to a residential area in the provincial capital of Ha Long City. However, the locals are still permitted to maintain row boat tours in the bay to both earn a living and preserve the coastal city’s rich culture. The service, which offers tourists rides across the resplendent bay, was launched in 2008 by the Ha Long Tourism and Transport Service Cooperative, according to Tang Van Phien, the cooperative’s head. Most boat rowers are from Vung Vieng fishing village, the second-largest fishing village out of the seven in the area. The service has drawn a large number of tourists, including foreigners, who come to relish the picturesque landscape and the villagers’ traditions and culture, Phien added. Nguyen Thi Bich, a boat rower and Vung Vieng native, said that she rows from 7:00 am to 10:00 am and 2:00 pm to 5:00 pm. She earns around VND3 million (US$ 141) a month from the job. A Mexican couple found the fishing villages an intriguing highlight of the World Heritage Site. Ha Long Bay was first listed as a UNESCO World Heritage Site in 1994 because of its outstanding, universal aesthetic value. In 2000 the World Heritage Committee additionally recognised the bay for its outstanding geological and geomorphological value, and its World Heritage Listing was updated, according to Wikipedia. Locals’ awareness of environmental protection has been raised considerably. Many volunteer to collect garbage dumped in the bay on a daily basis. Last month, Cua Van fishing village, another major village located in the dramatic Ha Long Bay, was ranked ninth out of the 16 best coastal towns in the world by U.S. travel magazine Travel + Leisure. According to the magazine, some 700 people (traditionally fishermen) live in anchored houseboats, making Cua Van a popular tourist attraction, as visitors like to see this unusual way of life.